Den-im … den-im … den-im … it’s Shark Week! It rivals TBS’s 24-hour marathon of A Christmas Story in legendary annual must-see TV programming. The Discovery Channel’s Shark Week is upon us! 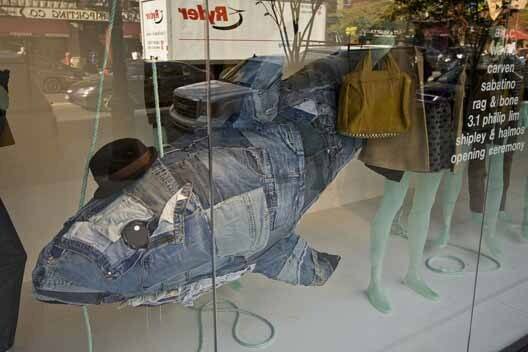 And to celebrate we found this DOPE denim shark, which was a Barney’s Co-op window display. Love it. This entry was posted on Wednesday, August 3rd, 2011 at 11:52 am	and tagged with A Christmas Story, Barney's Co-op, Canadian Tuxedo, Denim, Discovery Channel, Fashion, Fumiko Kawa, postaday2011, Shark Week, TBS and posted in television. You can follow any responses to this entry through the RSS 2.0 feed.